PHOTO BY JILL GOSCHE Hopewell-Loudon Elementary School teacher Jen Arbogast (right) leans over with student Demi Wilt as a butterfly clings to Wilt’s shirt Thursday morning. BASCOM — Memories of the Rainey family were in the hearts of Chieftains and on the wings of butterflies Thursday morning. Shirts in support of the family and Bascom Joint Fire District dotted the Hopewell-Loudon School gymnasium as children attended an awards ceremony on the last day of school. At the conclusion of the ceremony, winners of an essay contest that asked students to write about their heroes were honored. 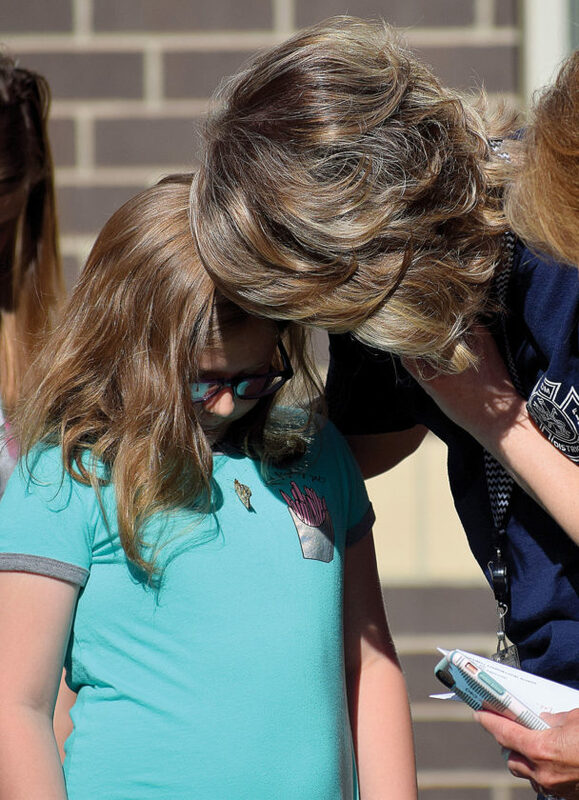 Student Demi Wilt wrote about how Jessica Rainey — one of five family members who died in a fire in October — would see her on the buddy bench. The bench is located on one of the school’s playgrounds. “My hero is Jessica. … She would help me cross the monkey bars. She was a great friend. She would play with me when I was sad,” Wilt wrote. A butterfly clung to Wilt’s shirt during a butterfly release in the courtyard after the awards ceremony. In October, James R. Rainey, 46, and his wife, Jodi L. Depinet-Rainey, 41; and their children, Austin James Rainey, 19, Cody Steven Rainey, 15, and Jessica Denise Rainey, 7, died in a SR 18 house fire. Austin graduated from Hopewell-Loudon in 2017, Cody was a sophomore and Jessica was in first grade. Students and the Raineys’ loved ones released 36 butterflies during the ceremony in the courtyard. Teacher Jen Arbogast said the memorial created for the Rainey family in the courtyard was constructed by staff and students. Appreciation was expressed to Troy Huth for donating stones; Brubaker’s Acres Family Farm Market for donating butterfly bushes; Bilger’s Lawn and Landscape for donating river rocks for students to paint; Tony Swanagan and students for preparing the memorial; Lisa Gelinas and students for painting rocks that line the memorial; teachers for inspiring students to look for heroes in everyday life; and students for their beautiful words. Three hearts were cut into the grass and filled with mulch, and painted rocks and butterfly bushes were placed in the mulch. Sue Rainey, Jim’s mother, said Jessica painted rocks all the time. There is going to be a butterfly above Jessica’s name on the cemetery stone, she said. “She likes butterflies. … (She) painted rocks at home,” she said. Pam Depinet, Jodi’s mom, said she was speechless. Students were well-behaved and involved with the Raineys, she said. “That’s probably Jessica,” she said, referring to a lingering butterfly. A poem written by fifth-grader Avery Landers in honor of the Rainey family was read during the ceremony. “Fly high butterfly, Fly so high you touch the sky. Fly high butterfly, Fly so high where the angels lie,” she wrote.